1. 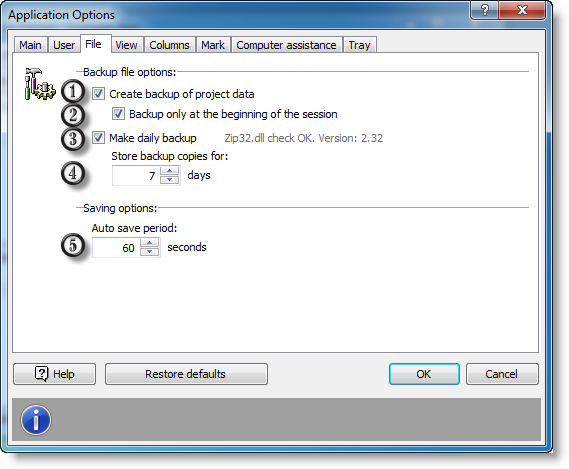 If this option is on, a backup file (*.bak) will be created on each saving data to file. 2. If this option is on, a backup (*.bak) for each saved file will be created once per each application launch. As far as by default data are saved each minute, in case of data loss (e. g. casual project deletion) it is easier to restore data if this option is on. 3. If this option is on, every day the data file will be packed to ZIP. The archive name consists of your data filename, a date and the .zip extension. 4. Here you specify how long you want to keep a backup (in days). 5. Automatic backup period. 60 seconds are recommended.